Port Grimaud is situated very close to St. Tropez, at approximately 100 kilometers from Nice. if you want the details, just click on the map below. 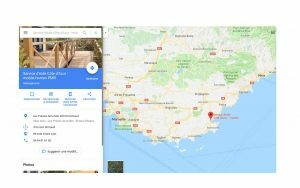 The nearest railway station is at St. Raphaël. By air its possible to fly to the airport of Nice, Toulon-Hyères or even Marseille. Thanks to our adapted minibus we are able to come and collect you from the station or the airport.